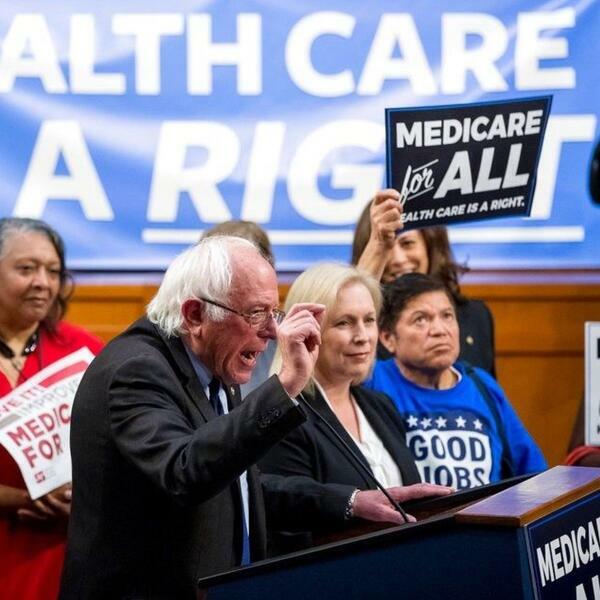 Air Date: 09/29/2017 Today we look at the Bernie-Sanders-lead movement to implement the most comprehensive universal health insurance system in the world Be part of the show! Leave a message at 202-999-3991 Join the Best of the Left Social Network! Donate or become a Member to support the show! Visit: https://www.patreon.com/BestOfTheLeft how Notes Ch. 1: Opening Theme: A Fond Farewell - From a Basement On the Hill Ch. 2: Act 1: America Is Ready For Universal Healthcare - Majority Report (@MajorityFM) - Air Date: 09-20-17 Ch. 3: Song 1: Turning on the Lights - Speakeasy Ch. 4: Act 2: ANALYSIS: Bernie's Single Payer Healthcare Proposal - @DavidPakmanShow - Air Date: 09-14-17 Ch. 5: Song 2: On Our Own Again - The Pine Barrens Ch. 6: Act 3: Understanding the extraordinary costs of our health care system - Who What Why - Air Date 7-14-17 Ch. 7: Song 3: Flattered - Delray Ch. 8: Act 4: Understanding the Canadian health insurance system - The @BernieSanders Show - Air Date 9-17-17 Ch. 9: Song 4: Dirtbike Lovers - Desert Orchard Ch. 10: Act 5: No Is Not Enough Naomi Klein on Bernie's Medicare-for-All Bill & Future of Democratic Party - @DemocracyNow - Air Date 09-18-17 Ch. 11: Song 5: Flagger - Cloud Harbor Ch. 12: Act 6: What Can YOU Do To Support the #Medicare4All Movement? - Best of the Left Activism Ch. 13: Song 6: Chilvat - Lillehammer Ch. 14: Act 7: Challenging the private health insurance orthodoxy - The Zero Hour w @RJEskow - Air Date 9-16-17 Voicemails Ch. 15: Amazon App doesn't help BotL - Alan from Connecticut Voicemail Music: Loud Pipes - Classics Ch. 16: Final comments on Amazon, brainstorming ways to join the medicare-for-all movement and teasing our latest members-only show Closing Music: Here We Are - Everyone's in Everyone (Additional music from Blue Dot Sessions) Activism: TAKE ACTION What are the top 3 things you can personally do to contribute to the movement to support #Medicare4All? Call the voicemail line at 202-999-3991 and tell us your ideas to inspire others Read the details of Sen. Sanders’ Medicare for All bill Some other ways to get involved: Our Revolution groups (Sen. Sanders’ action organization) Health Over Profit (nonprofit grassroots org fighting for Medicare for All) Fight4Medicare.com (grassroots #Medicare4All action campaign) Social Security Works (nonprofit defending our social programs) Truth Out “Medicare for All” Series (independent media outlet looking to focus on Medicare for All coverage) MoveOn.org Petition (do NOT let signing this be all you do!) EDUCATE YOURSELF Bernie Sanders's new Medicare-for-all plan, explained (Vox) The Political Genius of Bernie’s ‘Medicare for All’ Bill (The Nation) Bernie’s “Medicare for All” actually is the pragmatic health care solution (Salon) The Loss of Morality in America’s Healthcare Debate (Washington Post) Sanders's Bill Electrifies Growing Single-Payer Movement (truth-out) "Medicare for All": A Uniting Call to Action in the Age of Trump (truth-out) Written by BOTL Communications Director Amanda Hoffman Produced by Jay! Tomlinson Thanks for listening! Visit us at BestOfTheLeft.com Support the show via Patreon Check out the BotL iOS/Android App in the App Stores! Follow at Twitter.com/BestOfTheLeft Like at Facebook.com/BestOfTheLeft Contact me directly at Jay@BestOfTheLeft.com Review the show on iTunes and Stitcher!